Monday’s ad is for Schlitz, from 1906. In the first decade of the 20th century, Schlitz Brewing, then one of the largest breweries in the U.S. after the industry had shrunk from over 4,000 to around 1,500 in just 25 or so years, did a series of primarily text ads, with various themes. 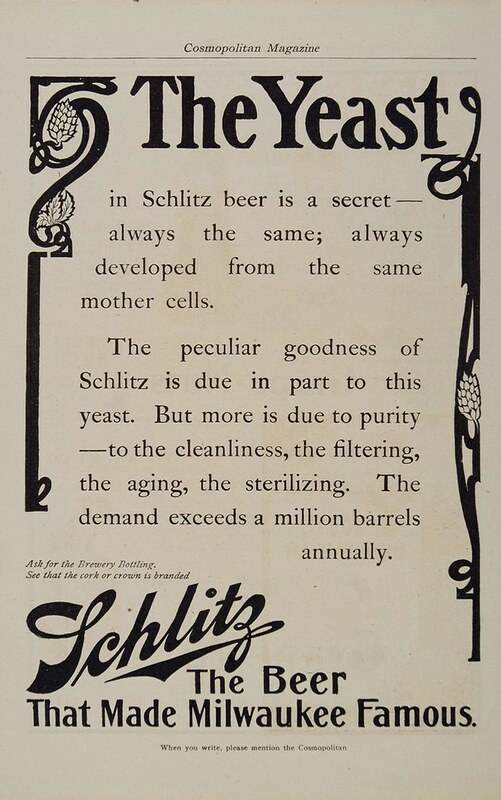 In this ad, Schlitz claims their yeast is “a secret” and that it’s responsible, at least in part, for its “peculiar goodness.” I’m not sure I’d want to describe my beer as “peculiar,” not matter good its peculiarity.